The once and future Mr. Quinn. I am going to tell you a dirty, dirty little secret. Are you ready? Here it is. 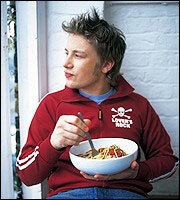 I have developed an unhealthy crush on Jamie Oliver. Yes, he of the pouty trout lips and irritatingly perfect family (children called Poppy Honey and Daisy Boo), and the endlessly irritating adverts for Sainsburys supermarkets. I want him not to be married to his childhood sweetheart Jools so that he can marry me and we can have ridiculously-monikered babies together. And he'll cook them perfect little organic baby meals and buy me vintage cars for my birthday and it'll all be just... dreamy. I never used to like Jamie Oliver much. I find his cookbooks to be craptacularly laid out (I only deal with cookbooks where I can, finding myself having inexplicably bought an aubergine at the halal cash and carry, look in the index and find ideas for what the hell to do with it). His "awright geezer" act and his Vespa annoyed me. I bristled when he signed a deal to be the face of one of our big supermarket chains, and was suddenly all over the telly pretending that he and his mates always get the bacon for their Sunday morning hangover bacon butties (awright geezer, yeah sound yeah, awright mate, quality!) from Sainsbury's, although I never felt the urge to call him a "whore" for it. Then something interesting happened. Jamie Oliver appeared to develop a social conscience. In 2002, Channel 4 aired a series called Jamie's Kitchen, chronicling Jamie's attempts to open a restaurant called Fifteen in London's achingly trendy Hoxton. Having staffed it with a variety of school dropouts who he attempted to put through chef boot camp, the series, predictably riddled with swearing and flaming rows, hauled in 5 million viewers, and culminated in Jamie's trainees cooking lunch for Tony Blair and the Irish Prime Minister at 10 Downing Street. Fifteen remains open, and has put several more batches of trainees through culinary crash courses -- all the profits made by the restaurant go to a charity that helps train young adults in the catering and hospitality industry. I watched Jamie's Kitchen, but I'll admit -- I wasn't 100% convinced. Jamie had obviously worked hard on the project, but it all smacked a bit too much of convenient conscience-growing in order to expand the appeal of the "Jamie Oliver brand." What changed my mind was a little four-part series called Jamie's School Dinners, which showed up on Channel 4 earlier this year. I now want to see Jamie Oliver given a knighthood, maybe even his own castle and a shiny suit of armour. I want him to oust Tony Blair in a military coup involving highly-trained squadrons of ladle-wielding dinner ladies marching on Downing Street. I also want him, as previously noted, to be the father of my babies. The premise was this: Jamie Oliver realised that school meals in this country are largely, as he so charmingly puts it, "scrotum-burger shite," due to the cost-cutting methods of private contractors all out to put the best bid on the table for supplying schools. Understandably, Oliver felt that when we spend more on meals for prisoners than we do on meals for school children (an average of 37p, or 70 cents, per portion, as opposed to the 60p we spend on lunches for people in the slammer), something is not quite right with the picture. He decided to try to revolutionise school dinners. Starting out in one London high school, he battled manfully against the students' instinctive reaction (chucking it in the bin) to his healthy Thai chicken curries and ciabattas, and then spread the revolution to every other school in the borough of Greenwich that would sign up. At the time of writing the British government has just announced that it's going to spend an extra £280 million ($526 million) over three years on school meals, after Oliver pitched up on the doorstep of 10 Downing Street clutching a 270,000 signature petition. CJ says the 2004 is made of turkey. England is scary. The series made absolutely compulsive viewing. This was brilliant telly, let's be quite clear. Oliver demonstrated his natural instinct for what makes good TV, via stunts such as mincing up turkey off-cuts, lard and powdered additives into pink lumpy slurry to show horrified kids exactly what went into their beloved Turkey Twizzlers. He dressed up as a giant corn-on-the-cob and let primary school kids chase him around a playing field, and my ovaries squealed, let me tell you. Millions across the country sighed with satisfaction when Oliver invited Charles Clarke, the then Education Secretary, to lunch at Fifteen, and dared him to eat one of the vile grey unidentifiable meat-sticks that used to be served up at Kidsgrove, his Greenwich pilot school (the minister chewed manfully and just about refrained from vomiting on the table linen). Nora Sands, the jovial Irish head dinner lady at Kidsgrove, quickly became a scene-stealer, embracing the project whole-heartedly but howling like a banshee at Oliver when he stepped on her toes or failed to deliver dinners on time (adorably, when asked whether the experience had changed the way she cooks at home, she admitted "I [still] like my eggs fried in dripping"). 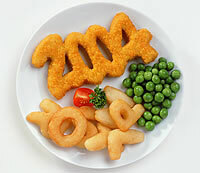 Jamie's School Dinners aired at just the right time for the nation, and for me -- just ahead of the launch of a general election campaign, when The People's Tone was keen to sweep memories of WMD under the carpet with feel-good stories, and when a spectacularly weak new Education Secretary had just been parachuted into the job and was ripe for being shoved about a bit by public opinion. For me, JSD aired when I had been teaching in a 'challenging' London school for six months, and when my rage at the inadequacies of our educational system had reached a nice rolling boil. My school's canteen is supplied by one of the big private contractors that have come under pressure in the wake of JSD -- I can't bear to eat there, and I want to weep when I do break duty and watch my students waltzing by me with a hot-dog in each fist, and a doughnut tucked into each pocket, because I know that for some of them, this is their one square meal in a day. In London's most difficult schools, like mine, where over 33% of the students are entitled to free school meals and for many reasons often don't get proper, nutritious food at home, feeding children processed, fatty, beige rubbish isn't just crummy -- it's criminally irresponsible. It also makes teachers' lives even tougher than they have to be, because a badly-fed kid is a badly-behaved kid, a child too busy bouncing off the walls under the influence of sugar and E-numbers to focus in class. This is why I think Oliver deserves to get boffed on the shoulders with the Queen's big old sword. If his school dinner revolution can spread beyond Greenwich, it'll be one of the best shots in the arm this country's school system has had in decades, and it will potentially change the shape (literally) of British society in decades to come. Too often television lives up to its nickname of the idiot box, but this series showed what the medium can do ® it is possible to serve up popular, populist, entertaining telly that nevertheless changes the world. TV needs fewer home makeover shows, and more social makeover shows. If Jamie can now make a fun TV show that will deal with the intractable problem of people who gob all over the pavement while waiting for buses, or put an end to people standing in long supermarket queues for ages and then spending ten minutes finding their money once all their shopping is bagged, I say we just go ahead and make him King. Jamie's School Dinners has now been sold to TV channels in Singapore, Thailand, Hong Kong, Australia, New Zealand, Germany, Norway, Denmark and Sweden. 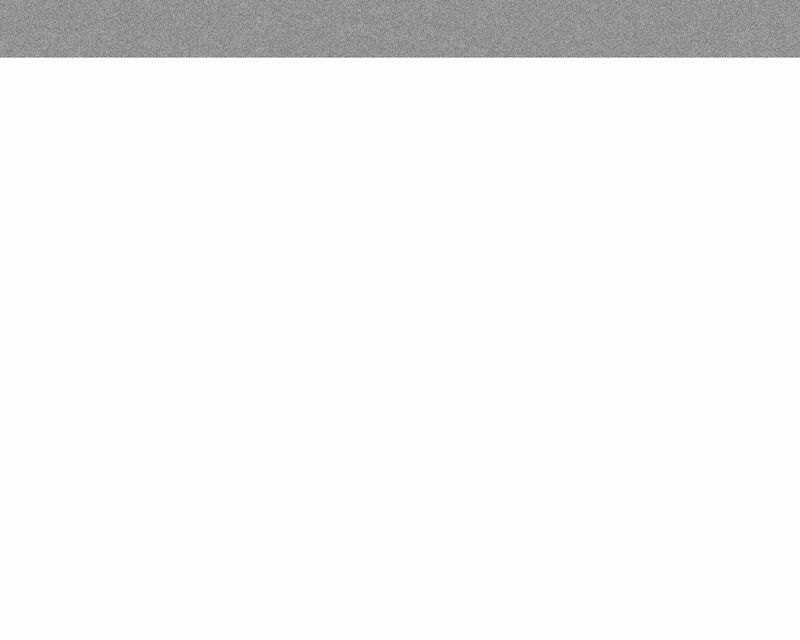 Americans, it seems, will just have to wait. I hope you aren't kept waiting too long, because JSD knocks The Naked Chef onto its arse as televisual entertainment, and with both of our great nations getting fatter by the day, we need (Sir) Jamie Oliver to zoom in on his Vesps like a chippy little superhero and remind us how our kids ought to be eating. Return to Vol. 1, Episode 2.